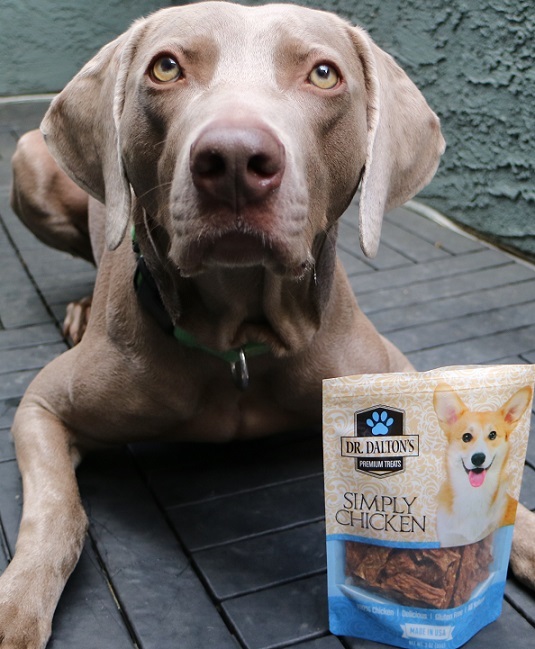 I want to let you know about the high-quality, single-ingredient dog treats from Dr. Dalton’s Premium Treats. Dr. Dalton’s treats are made from dried raw chicken, beef or pork, and the company says its treats are sourced, produced and packaged in the United States. 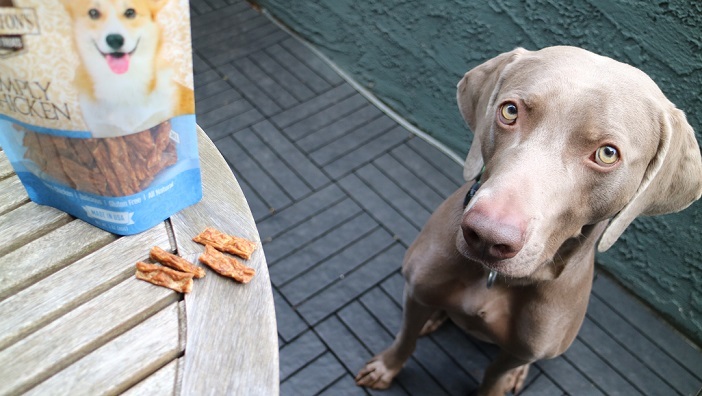 My dogs went nuts over Dr. Dalton’s treats, and I’m sure your dogs will love them too. This post is sponsored by Dr. Dalton’s Premium Treats. 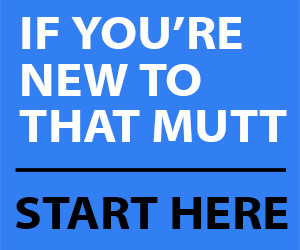 Use code thatmutt10 for 10% off your first order. Click here. My two dogs love these snacks, and I don’t have to worry about the ingredients because these are single-ingredient treats made from real meat. They contain no salt, coloring, sugar, sweeteners, gluten, grain, chemicals or preservatives. Just meat. Another nice thing about Dr. Dalton’s treats is they are designed by a dog trainer for dog training (more on that below). The treats are not greasy so I can keep them directly in my pocket on walks or at training classes. They also break easily into smaller pieces. 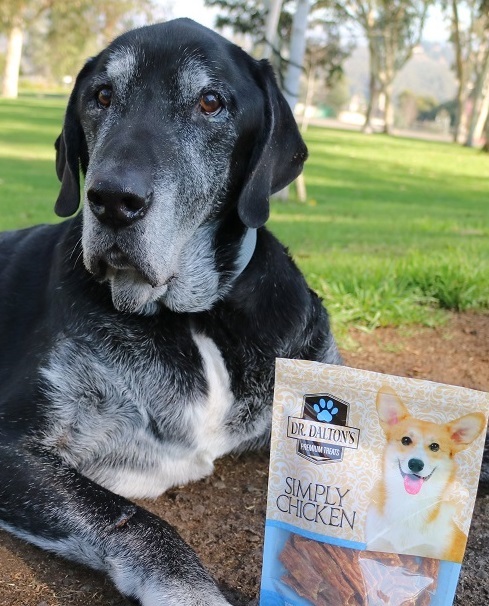 Dr. Dalton’s Premium Treats are available in “simply beef,” “simply chicken” or the “meat medley” which contains chicken, beef and pork. The treats are small and crunchy, about 1.5” in length. What is the cost? Plus a coupon code! On Dr. Dalton’s website, the treats are $14.99 for a 3-ounce bag or $28.99 for a 6-ounce bag. Of course, higher-quality treats are going to cost more than average. The treats from Dr. Dalton’s do not contain excess water since they have been dried. Therefore, each 3-ounce bag has about 45-50 treats and will last you quite a while. The company says it uses only high-grade, quality muscle meat, and because excess water is removed and no fillers are added, there is no need for Dr. Dalton’s to add preservatives, binders, flavorings, colorings, etc. The final product is 80% crude protein, according to the package. Dr. Susan Dalton is a certified professional dog trainer who uses positive reinforcement training methods. Her business, California School for Dogs, offers both group classes and private lessons. Her website says she has trained hundreds of dogs and specializes in helping dogs with fear and aggression. Treats are obviously a big component in Dr. Dalton’s training program, so she started making her own treats in 2012 using simple, clean ingredients, according to her website. It was her training clients who actually convinced her to make the treats available for purchase. I recommend Dr. Dalton’s Premium Treats for training because they are not greasy and you can keep them directly in your pocket. They are also a good choice if you are a raw feeder or are looking to feed your dog a higher-quality treat for training, snacks, etc. These might not be for you if they’re out of your budget or if you prefer to make dehydrated treats yourself. Dr. Dalton’s is giving away a 3-ounce bag of treats to two winners. *CLOSED. To enter, all you have to do is leave a comment below so I know you want in on the drawing. Must have a U.S. mailing address to win. Let me know why your dog needs a bag of treats! I’ll choose two winners at random on Tues Feb 13. The winners can choose between chicken, beef or the meat medley. Are you interested in a healthier treat option for your dog? Let me know in the comments, and please share this post with anyone who might be interested in Dr. Dalton’s Premium Treats. That Mutt’s $5 and $7/month Patreon member get free entries into all the blog’s giveaways, including this one. We still have 4 spots available. Click here. I have a Great Dane who seems to be allergic to EVERYTHING! I’ve been cooking for him — chicken, potatoes and carrots. As you can imagine, that’s a lot of cooking. I don’t even cook for myself. I also bake peanut butter and cheerio treats. I’d love to have something in the cupboard for the times when the kitchen isn’t calling me! I’d lessen the carbs – use veggies with more nutrition like pumpkin or leafy greens, green beans, broccoli, etc. There are many recipes online for treats and they’re so easy to make. A very popular one with my Danes is bacon cheddar cookies. I grind my own oats to make the flour – so easy and cheaper! Carbs (sugars) tend to cause a lot of issues including sensitivity and allergies and reducing them may help your dog’s issues. I’m about to get a Silken Windhound (a birthday present from my husband) and I have a senior Min Pin who has liver problems. So single ingredients are extremely important to me. Thanks for the offer! Sounds awesome! I’m going to have to try them out! Thanks for the heads up! I love getting these kind of simple treats for my dog! I haven’t tried Dr. Dalton’s yet, but I’m always looking for new treats for her!! i have 2 yorkies and they are fussy about their treats this sounds like somthing they would like.. These treats sound similar to some I can occasionally get at Costco. They are wonderful for training. As a result of our very hard and persistent work – and lots of treats – Zeus almost has proper door bell manners. Recently become a new puppy parent, she’s saint-Bernard and lab mix; will be 14 weeks old in a few days … were always looking for yummy healthy treats specially for training sessions. Awesome offer, thank you! I have one pup with digestive issues these types of treats are great for him! my almost 2 year old lab has acid reflux, I have to be very careful about what I give him. I always have treats with me in case a store employee offers him one [jhome depot!] and I cant let him have it. would love healthy treats which which also appeal to him. My dog Jackpot is currently in a few training classes, so we go thru lots of treats. I like to rotate the treats. These would be great for “jackpot” treating…. I have two adorable rescue pups who would love to try some new treats! My dog had a sensitive stomach and I love all natural treats! 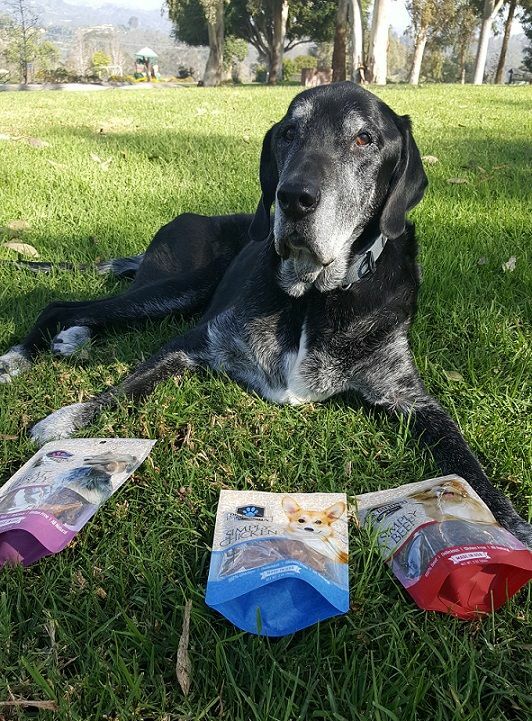 i would love to try these treats for my dog! These treats would be great for my girls! I love that they’re single ingredient treats and sourced in the US. They’re the perfect size for training. I would love a free sample to see how well they go over! Now that I have a second rescue pup, 7 years old, along with my 6 year old, both treat obsessed, with sensitive tummies, it would be wonderful to be able to have them try these treats! Thank you. Elderly dogs enrich our lives every day!!! Many treats seem to upset my pup’s tummy but these look like something she could eat! Would love to try! I will be getting a wonderful golden doodle in the spring (our second one) and am so excited! I love your blog and the many helpful and informative tips. I am very nutrition conscious for my dogs and will certainly try these treats. Thanks for your dedication to man’s (and woman’s) best friend! Clementine my beagle is the first dog I’ve met that doesn’t like peanut butter so buying treats can be a hassle. Thanks for the discount code on these, I’m sure she will love them! Benny (who is my pride and joy, the yorkie) would love these! I don’t usually give him treats for various reasons but I might make an exception for these healthy treats. Yager is such a comfort to me. My mom loves his visits. He likes to bark a lot. But our good boy! I would love to try these healthy treats to train my 2 rescue furbabies. Stella has a sensitive tummmy so I think these would be especially good for her. I only want the best for my dogs. They love trying new things too. I would love to win some treats for my 3 pups! We kind of inherited all of our dogs from family members so that they would have loving homes. We have a 13 year old shih tzu, an 8 year old pitbull/boxer mix, and a 9 month old pomsky. That puppy especially loves treats. Haha. Since training is an ongoing thing with Lambeau, having good quality treats that can be used as training treats is great for us. I like the single ingredient aspect of these, and I am sure Lambeau would love them! Junior is always looking for a new favorite treat! Why my dog needs a bag of treats? Well, cuz she’s spoiled and these look and sound like the yummiest! I have an extremely picky dog, who won’t even eat certain treats. I would love to try out a new treat that is meat with him as I am sure he would like if it was made of real meat. Ginny would love the beef or pork!!! My two Siberian Huskies would be thrilled to win some new, delicious treats! And I would love to win as well! Thy are very food-driven and LOVE to learn some new tricks which I will teach them with these. A healthy treat is what all dog lovers appreciate. Thank you for your contest. I definitely am. My dog eats just about anything. He loves salad. So a healthy treat option with his appetite for anything would be great. They sound pawsome! I like that they are a premium treat that contains no sugar or salt 🙂 My dogs would love a bag of the chicken 🙂 Thanks for the chance!